Photo credit: Twitter | @RubenOlmeida. 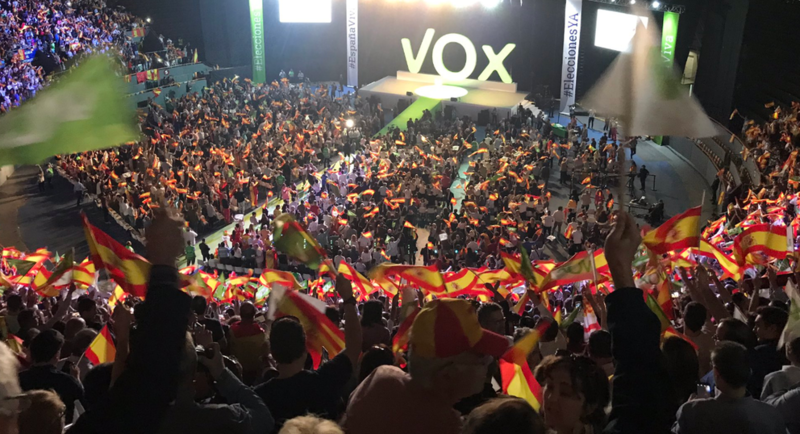 Spain’s far-right startup is poised to pick up its first seats in European Union parliamentary elections next year and is given a shot at becoming the first anti-immigration party to enter the Spanish parliament since democracy was restored. More, more & more immigration. Open borders worldwide. One law to rule them all. Let the blood continue to spill. Until the whole world is a needy third world mass of cattle & sheep. We must remember that ultimately this isn't about the intention to have 'Laws' governing the masses. It's about ONE RULE dictated by (((ONE GROUP OF PEOPLE))) who think they have the right to destroy everyone else for the sake of their own nepotistic power. Pure EVIL!!!! Send (((them))) ALL 'back' to Israel, and then demand their borders be opened WIDE!!! Thank God for Trump! Nobama was setting himself up for his role as the Global Dictator and the hildabeast was the final nail in our coffin. We are heading in the right direction w/ asylum being revoked if caught here illegally but the birthright citizenship needs to end proactively by booting anyone "birth-righted" after a certain date. what is taking the Europeans soooooo long to figure out that they are being invaded.